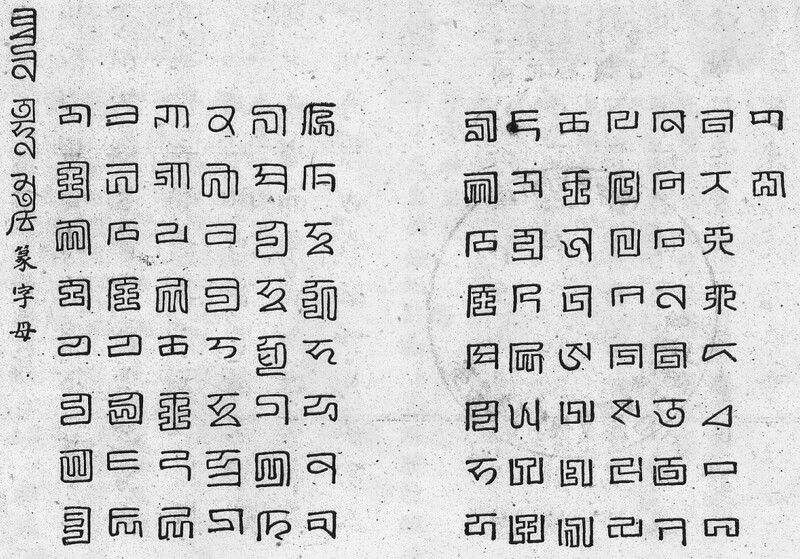 As I mentioned recently, the rhyming dictionary Menggu Ziyun 蒙古字韻 provides a list of seal script forms of Phags-pa letters. As this is the only source of information about Phags-pa seal script letters other than actual Yuan dynasty seals it is obviously a very important resource. However, the table of letters is quite confusing, and so this is my attempt to make some sense of it all. Source : Exact facsimile transcription of Menggu Ziyun in Luo Changpei 羅常培 and Cai Meibiao 蔡美彪, Basibazi yu Yuandai Hanyu 八思巴字與元代漢語 (Beijing: Kexue Chubanshe, 1959) -- for those interested a revised edition of this important work was published in 2004. The first problem with this table is the order of the letters in it. It is clear that the table is written in vertical columns running from left to right, and that for each Phags-pa letter the normal book form is given followed by one or more seal script forms (if the seal script form differs from the book form), but there appears to be no rhyme or reason to the order, which goes GA ꡂ, BA ꡎ, ZA ꡕ, KHA ꡁ, PHA ꡍ, JA ꡆ, etc. It is only when you look on the preceding page at the table of initial letters that entries in Menggu Ziyun are ordered by within each rhyme category that it is possible to understand the ordering. The table of initials is ordered according to the traditional "thirty-six initials", laid out horizontally in three rows starting from GA ꡂ, KHA ꡁ, KA ꡀ, NGA ꡃ at the left of the top row and ending with LA ꡙ, ZHA ꡔ at the right of the bottom row, and with vowels I, U, E, O, EE and semivowels W and Y in a vertical column on the far right. However, the person who wrote the table of seal script form letters has misunderstood the table of initials as reading in columns running from left to right, with the result that the table of seal script letters is completely misordered as GA ꡂ (first letter in top row), BA ꡎ (first letter in middle row), ZA ꡕ (first letter in bottom row), KHA ꡁ (second letter in top row), PHA ꡍ (second letter in middle row), JA ꡆ (second letter in bottom row), etc. The table below rearranges the original table of letters, with each group of letter forms on a separate row. Note that the ordinary Phags-pa letters are displayed with the "BabelStone Phags-pa Book" font and the seal script letters with the "BabelStone Phags-pa Seal" font, which you must install to see anything. The "BabelStone Phags-pa Seal" font contains all the seal script forms given in Menggu Ziyun, but some obviously misformed glyphs (e.g. the unjoined stroke on the third seal script form of the letter BA) have been silently corrected. The column labelled "Position" is the sequential position of the letters in the original table, counting from "1" in the top left column in vertical columns from left to right. The column labelled "Number" is the number of the letter in the list of thirty-six initials (see Table 2), which would be the expected ordering of the letters if they were not inadvertently misordered. ꡎ    The book form is closer to the letter PHA. ꡍ  The book form looks more like the letter BA. ꡀ  The book form is written oddly. ꡏ  The book form is missing the final stroke. ꡊ No seal script form of the letter is given, and the form of the letter DA in extant seals is indeed the same as the book form (). ꡰ  The book form does not show the extra kink that the second form of FA has in the Table of Initials. ꡆ No seal script form of this letter is given. Any seal script form would be expected to be the same as for Initial 36. ꡗ   The book form is wrongly written as the second YA letterform [U+A86D], but the first YA letterform [U+A857] would be expected here. ꡭ This letter is missing from the original table. ꡄ This letter is missing from the original table. ꡐ This letter is missing from the original table. ꡠ  As far as I can tell the seal script form is not normally written like this, but as  or . ꡡ   The two seal script forms are the isolate and initial forms of the letter. ꡦ The book form is misformed, and no special seal script form is given. In extant seals the letters EE and Subjoined Ya are virtually identical. ꡧ No special seal script form is given. In extant seals it is written as . ꡨ The book form is misformed, and no special seal script form is given. In extant seals it is written as . ꡢ It is not clear what this letter is. I am guessing it is a misformed letter QA, used for Mongolian but not Chinese, and so not in the Table of Initials in Menggu Ziyun. No seal script form is given, but it would be expected that the seal script form of the letter QA was a mirror form of the letter QA, i.e. . ꡥ  The letter GGA is not used for Chinese (or Mongolian or Uighur), and so is not in the Table of Initials in Menggu Ziyun. As I may have mentioned before, there is only one extant copy of Menggu Ziyun, and that is an 18th century manuscript copy (itself probably a copy of a copy of a 14th century printed edition), and it has many corruptions and misformed letters. It is therefore not surprising that many of the letters, both book form and seal script form, in the table of seal script letters are misformed. In most cases this does not matter too much as the correct form can be deduced from context, but the table shows one example of textual corruption that cannot be repaired. That is, there appears to be a column of eight letters missing (between what are the 9th and 10th columns from the left in the extant manuscript), which would have given the seal script forms for the letters YA (2nd form) ꡭ, CA ꡄ and TSA ꡐ. In the table above the positional numbering has been adjusted to take into account this missing column (positions 73-80). In the case of the letters YA, SHA, HA and FA, this distinction is also shown in the book forms of the letters in Menggu Ziyun, and these variant forms are represented in the encoding (U+A85A vs U+A86E, etc. ), although only two forms of the letter FA are encoded, and the table of seal script forms has distinct seal script forms for each of the three FA initials (17, 18 and 19). 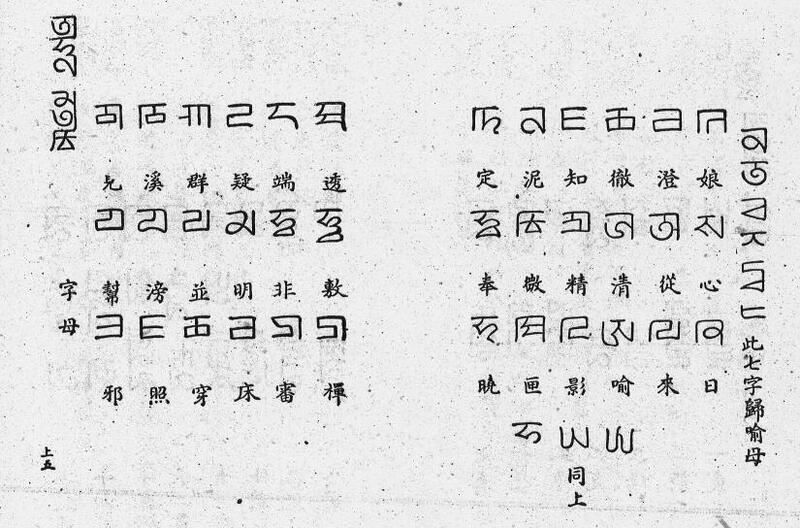 In the case of the two CHA initials (10 and 27), the book forms of the letters are not distinguished in Menggu Ziyun, and I suspect that the assignment of different seal script forms to the two CHA initials was an arbitrary decision by the author of the table, and probably does not reflect actual practice in Phags-pa seals. Indeed, I am quite doubtful that any of the seal script distinctions between letters that occur multiple times in the table of seal script forms are reflected in extant seals; but further research will be required to confirm or deny this.